1972: Pursue a martial arts career through the style of Kyokushin Kaikan, Shoringi Kempo, and Ashihara-kaikan of a New International Karate Organization. 1987: Decided to pursue a life in pottery. Built a kiln by his own effort spending a year. 1990: Made a presentation at 3rd. Hagi-ware Festival by recommendation of Yoshida Hagi-en Chokumon, and found ready favor. Subsequently, participated 13 times in the festival. Established his own kiln, Kousaian. 1998: Held a private exhibition at a Konpuan gallery in Kuga. 2001: Held a exhibition at a Yamaboushi gallery in Hagi. 2003: Held a joint exhibition with Ms. Yoko Yu in Yamaguchi. Held a private exhibition at Shinto gallery in Kobe. What made you decide to go into the ceramic art? 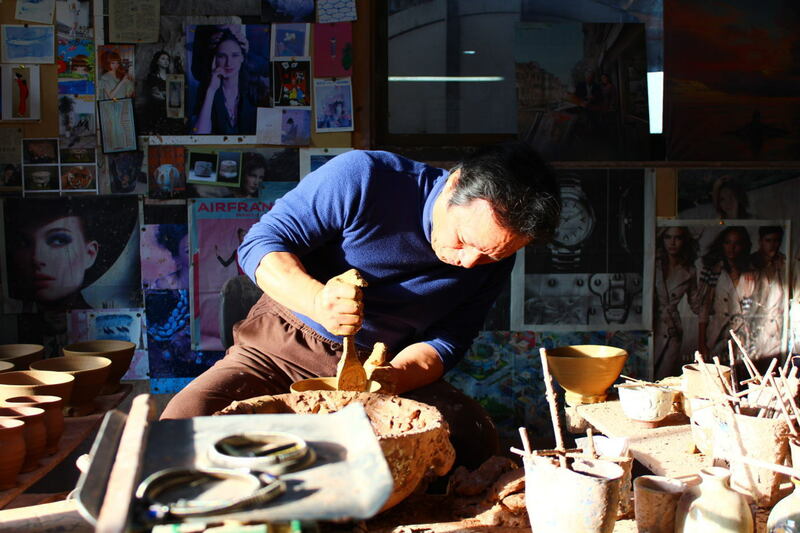 A direct cause is having visited the studio of the Hagi ware artist who is also my friend and saw the mud on the wheel constitutes the form of a vessel gradually. It was not only that I was impressed, but also something like a soul-awakening experience for me. After that, I built my own kiln and started to study ceramic art. You are also a master of Karate, and is there any relation with ceramic art? I began Karate at the age of twenty-first, before that, I could not last long whatever I do. However, by continuing Karate for 15years, I gained confidence, and when I became the instructor of Karate, the confidence changed to the firm belief that if I have a mind to do something, I can do. Regarding the relation with ceramic art, in Karate, one seeks to make himself a vacuum. According to Taoism described by Mr. Kakuzo Okakura, Vacuum is all-potent because all-containing. In vacuum alone motion becomes possible. One who could make of himself a vacuum into which others might freely enter would become master of all situations. In the ceramic art, the same principle holds. You excel in calligraphy, and what is the sense of meaning of calligraphy for you? I think that character express the dignity of those who write it. Moreover, we can give or receive the power through calligraphy. What is your goal in ceramic art? The process of creation is more important than the results for me. Making pottery is a means to be vacuum rather than a way to express myself.